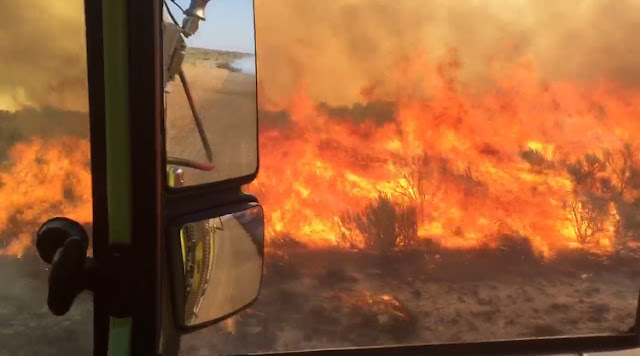 SHOSHONE, ID – Twin Falls District Bureau of Land Management (BLM) and Carey Rural Fire Department responded to a new wildfire early this morning, near the BLM fire station in Kimama. The Mac Rae Fire was reported to South Central Idaho Dispatch around 3:37 a.m., and is approximately 11,000 acres, burning in grass and brush. The fire is currently staffed with ten engines, two water tenders, two dozers, eight overhead and several air craft. Due to a Red Flag Warning for gusty winds and low humidity, fire fighters are experiencing difficulties containing the wind driven blaze. Engine crews, along with help from air craft, are working to contain the fire on the east side of the Carey/Kimama Road, as well as secure the north side of the fire into lava rock, near Craters of the Moon. Incident Commander, Jake Williams, estimates containment for tomorrow, August 8th at 6:00 p.m. with an estimated control for Tuesday, August 9th at 6:00 p.m. Due to the Red Flag Warning, these estimates could change. There are no structures threatened and the cause of the fire has been determined to be lightning.